We aren't all settled into our new house just quite yet... (sigh) but we have managed to continue some fun activities we have always incorporated into our little home here at the new one. Each time we do some of our "normal stuff" the more it feels like home. It just finally seemed right to have a sleepover for the first time in the front room of our new home for the kids last weekend. 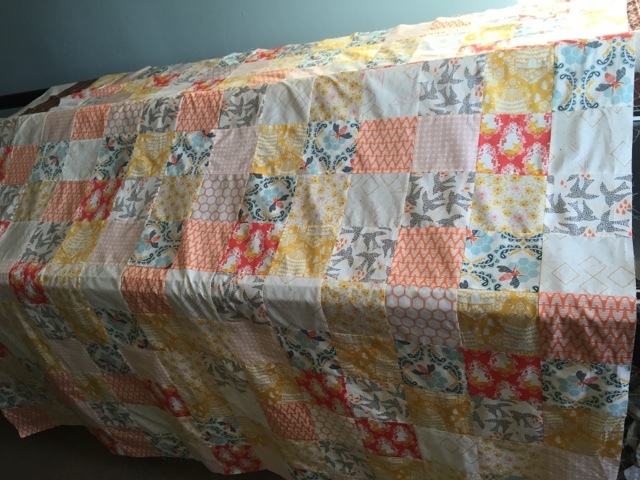 I was back from Quilt Market with the items from the book (Little Big Stuff - coming out August 2015), two of which are sleeping bags I made for the kids a LONG time ago. And they could be used for the FIRST TIME. Lots of firsts here. ONE MORE FIRST IS AT THE END OF THIS POST! Here is two little pictures of the whole loot before I sent it away last year at about this same time!! A whole YEAR. It is so crazy for me to see all of the cuteness in the pictures!!. So many cute items!! All of these are in the book. I love it!! I took a couple pictures of all of the stuff with the kids last year because I didn't know how long it would be before the items made their way back home. It was a good thing because I am so glad to have pictures especially since some of them are still out there floating around!! 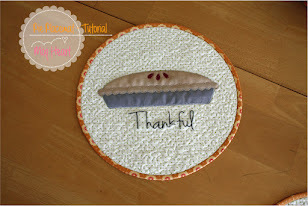 I even gave some away at Quilt Market at the schoolhouse so those won't ever come back. Looking at each project I just feel such a great sense of love. The are all so fun in all the different fabrics. I can't wait to see if sewists just love the book. Over the next few months, until the book officially is in stores, I want to just highlight some of the projects. If you are interested keep checking back. What better project to start with than the sleeping bags because of the sleepover last weekend with the kids. 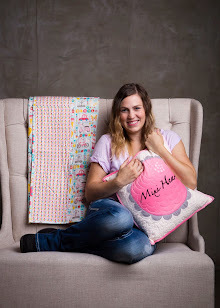 This is such a fun project in the book!! The kids LOVE, LOVE, LOVE them. I have lined the bag with flannel to make them cozy. They have large ties for little fingers to knot easily. They also have encased elastic for easy rolled-up storage. I quilted these with my long arm using two layers of batting (wool and poly/cotton). They have the perfect loft. I could go on and on about how awesome they are. See! They are so cute rolled up. The book includes themed chapters. This Campout Fun chapter also includes a little duffle where the fabrics match the sleeping bag. In each chapter the fabrics coordinate. Ya have to match right. I find myself habitually matching my whole life. I currently love this teal color. I have bought a lot of stuff in this color and so I am creating my own theme right now, matching my life in teal. Speaking of themes, matching also emphasizes the theme and it would be a shame not to make all the projects in the chapter because they match, lol. I have to say that I am a little jealous... therefore I am making my very own sleeping bag. I also am going to coordinate it with my Duffle Bag I made a bit back. Here is my progress photos. 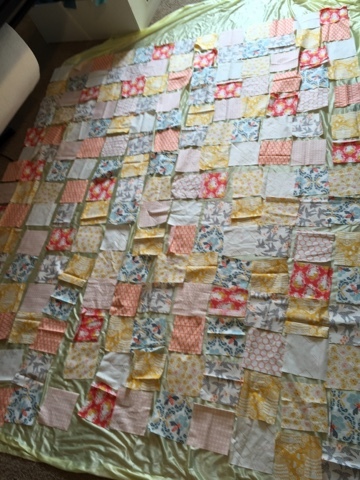 Here are the squares all sewn together. Last first is that this will officially be the first project I quilt on my new Statler Stitcher. A lot of you might not know what that is exactly so I will explain. I have had my long arm for about two and a half years. It is fabulous!! I love it!! 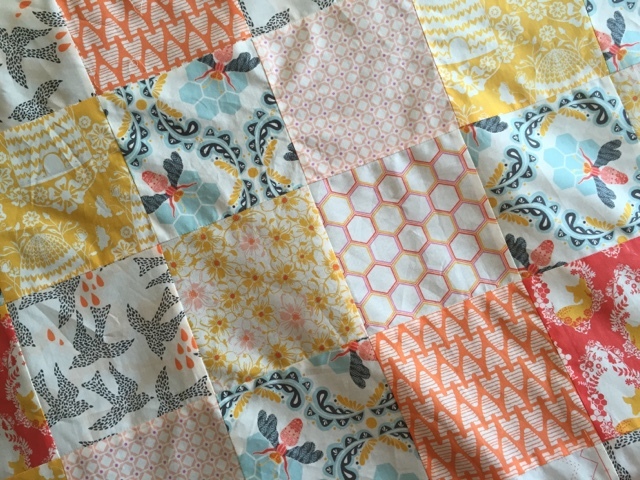 Though sometimes I feel torn between quilting for others and making time to work on my own sewing projects and my own designs (patterns, drawings, etc). This is where lies the problem. I didn't have enough time to do both! The solution is to add a computerized system to my existing long arm. I got it retrofitted today. I got trained this week and I am so excited to see if my training sunk in. And I am also nervous about quilting on my own without my awesome teacher by my side. But just like everything you just have to jump in and figure it all out. So why not start with a super cute soon-to-be sleeping bag. Right! AHHHH!! I am nervous (biting my fingernails nervous). So stay tuned for a finished project. In the meantime here is the delicious fabric that I used!! Oh my goodness I could just die. I love the bees. I love the pink. I love the yellow. I love the blue. I love the graphic prints. I love the beehives. I love the hexies. I love the deer. I love the floral. I just like the birds, but they totally work. So I am sure I am going to love the sleeping bag. Sweet as Honey. She had a revolutionary idea: She would make more time for life's truly important things. First on the list breathing. How sweet it is to Bee Loved. I prefer the company of happy people that are believers in magic, and the magical people who are believer in happy. First just do it, Then do it Better. Your new site looks great! And I love the sleeping bags. 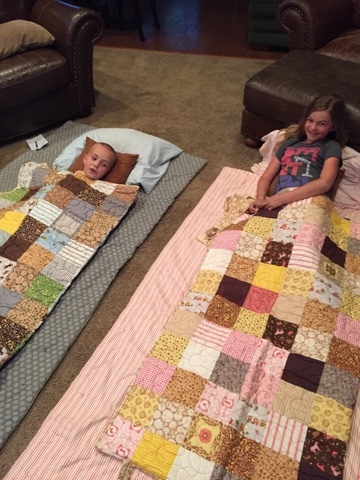 They are adorable, plus how many people have made their own sleeping bags? !